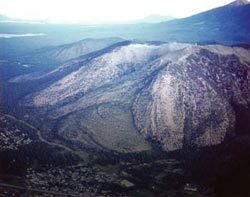 Elden Mountain is a lava dome in the San Francisco volcanic field in Arizona. Photo courtesy of U.S. Geological Survey. Hundreds of inquiries about dome mountains reach our website every month. Utah teachers who address landforms often identify mountain types formed by different processes. Up until the 1990s, some curricula materials listed four types of mountains (although there are more): fold, fault, volcanic, and dome. Teachers often defined a dome mountain as forming from rising magma that pushed the overlying rock layers upward to form a dome shape, without the magma breaking through the surface. However, geologists have a broader dome-mountain definition that includes any region of flat-lying sedimentary rocks warped upward to form a roughly circular shape, as well as accumulations of lava that pile up over a volcanic vent. Adding to the confusion is that many mountains that do not fit the formal definition above are called dome mountains just because of their rounded shapes. These mountains should be referred to as just “dome-shaped” mountains. To help unravel some of the ambiguities, let’s take a look at several dome features and how they are formed. A dome is a circular or elliptical uplifted geologic feature on which the rock layers slope gently downward in all directions from a central high point. Generally the term is used for any dome-shaped landform. What are some of the dome structures? Lava domes, salt domes, salt diapirs, dome mountains, and laccoliths are several of many dome features. Lava (volcanic) domes are rounded, steepsided mounds built by the accumulation of viscous lava that typically does not move far from the volcanic vent before cooling and crystallizing. Salt domes are formed by upward-flowing salt that warps the overlying rock layers. Salt domes are common along the Gulf Coast where salt beds are covered by a thick sequence of sedimentary rocks. The weight of the overlying rock layers forces the salt to flow upward. Salt diapirs are “pierced domes,” where the overlying uplifted rocks have been pierced or ruptured by the rising salt core. A Utah example is the Onion Creek salt diapir. Diapirs can also be formed by flowing shale or magma. The salt core breaks through the overlying rocks, and possibly the surface, creating a salt diapir. Dome mountains form in areas of flat-lying sedimentary rocks that are warped up to create a roughly circular shape. A Utah example is Navajo Mountain, which most likely has a core of igneous rock that arched up the overlying sedimentary rock layers. 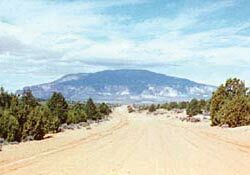 Navajo Mountain in San Juan County is a dome mountain that was probably formed by a laccolith. Laccoliths are large bodies of igneous rock that were injected as magma between sedimentary rock layers, arching the overlying layers into a dome-like form while leaving the rock layers below relatively flat. Southeastern Utah’s laccoliths are the La Sal, Henry, Abajo, and Navajo Mountains that rise above the flat sedimentary rock expanses. The La Sals, Henrys, and Abajos have aggregations of peaks composed of the igneous rock now exposed after the overlying sedimentary rock layers were eroded off. Navajo Mountain, a solitary dome mountain, is different in that the sedimentary rocks still cover the probable underlying igneous intrusion. Example of a laccolithic intrusion arching overlying sedimentary rock layers that still cover the igneous rock (similar to Navajo Mountain).